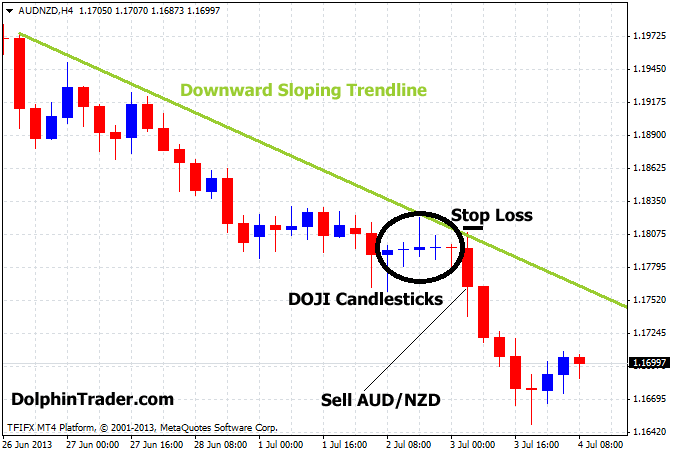 Doji candlestick patterns can be very useful to pinpoint entry signals in both trending and flat markets. The Doji is composed of a very small body with upper shadow and lower shadow. There are 4 types: Doji, Long Legged Doji, Dragonfly Doji and Gravestone Doji. See illustration below. Download the Candlestick Pattern Recognition Master Indicator. Draw an upward sloping trendline to confirm the uptrend. Look for Doji patterns forming near support levels in an uptrending market. Go long when the candlestick has closed above the Doji pattern. Set stop loss below the buy bar. Take profit: Use risk-to-reward-ratio at least 1:2. Draw a downward sloping trendline to confirm the downtrend. Go short when the candlestick has closed below the Doji pattern. Set stop above the sell bar.